I recently bought something at a store (you remember “stores”, don’tya?) that I hadn’t done business with before. By the time I got home with the product, I had already received several emails from the company hawking more stuff. Naturally, I clicked on the unsubscribe button. What’s the response I get? Why is it that when I buy something, the charge is applied before I put my credit card back in my wallet? 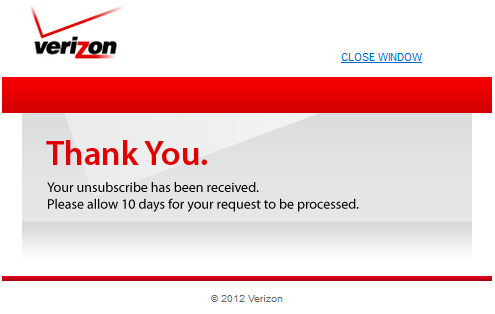 But when I try to unsubscribe – a completely electronic transaction – it takes 7 to 10 days??? I’ve done unsubscribes that said it would take 4-6 weeks! Yikes! The whole stinking internet was built in less time! Must be “switch flipper syndrome.” Or maybe they’re trying to save money by using slower, less expensive electrons. Then there are those companies that force you to call to cancel their services (again, not mentioning names, V*****n) or even “opt out” of some mailing list they put you on that you never wanted in the first (or second) place. That’s also a completely automated process, but they want you on the phone to try to either talk you out of leaving or sell you more. How many people end up doing both? Probably more than a few. These people are trained to be persistent, nay, relentless in hounding their soon-to-be-former-customers. I guess they have nothing to lose. They already lost ya. This entry was tagged brian regan, opt out, switch flipper, unsubscribe, verizon. Bookmark the permalink.